Some of history’s most star-making sitcoms are built on the flimsiest premises. “Bosom Buddies” is about men who masquerade as women so they can live in an affordable apartment — and that gave us Tom Hanks. “Welcome Back Kotter” is about a high school teacher who goes back to his Brooklyn-based alma mater — and that gave us John Travolta. “Cheers” is about a bar and we still got Woody Harrelson, Ted Danson, Rhea Perlman, and no one else. So even though “Happy Together” may sound like a hard pass based solely on its description — a famous teen heartthrob moves in with a complacent married couple — the point is this: Don’t dismiss a TV show because of a goofy start, and don’t give up on “Happy Together” after its pilot. Based on executive producer Harry Styles’ two years spent living in fellow executive producer Ben Winston’s attic, “Happy Together” is much more about the home-owning couple than their famous houseguest. Jake (Damon Wayans Jr.) and Claire (Amber Stevens West) are happily married Los Angelenos who are just like everybody else! They worry about their weight. They watch a lot of TV. They provide room and board for an extremely famous 20-something singer. Oh, do you not have a very young and very rich houseguest who texts with Rihanna and stars in photoshoots that suspend him upside-down from the ceiling? Well, someday you just might. Even though Claire and Jake work pretty common nine-to-five jobs — Claire is a restaurant and bar designer, Jake is an accountant — their mundane existence is exactly what attracts Cooper James (Felix Mallard) to shack up with them in the first place. After a bad breakup that’s attracting a lot of paparazzi attention, Cooper looks down his list of business associates and picks the most boring title: accountant. That’s Jake, and — not wanting to turn away a client, music superstar, and human being in need — the young couple agrees to let him stay a while. In the pilot, “Happy Together” feels like a parody of itself. None of the characters feel real, all of the comedy is amplified, and it just feels silly. Older viewers (or the typical demographic for CBS) will probably flash back to shows like “Bosom Buddies,” while younger viewers (or the target demo for “Happy Together”) might think of “Horsin’ Around,” the show-within-a-show featured on “BoJack Horseman.” It doesn’t matter that something like this really happened — that Harry Styles moved in with Ben Winston for a few years — when you’re watching a fictional take on TV, leaving the “Happy Together” premise as a huge pill for the audience to swallow. But instead of handing viewers a glass of water (and a mallet to crush the dose into dust), the series wisely refuses to acknowledge the inanity of its premise: It’s a farce. What feels like a mistake after one episode starts to seem brilliant by the third, mainly because it becomes clear that you’re not supposed to take any of this seriously. Everything involving Cooper is an excuse to confuse and confound the central couple. Even Mallard’s lackadaisical performance (the exact opposite of what a charismatic young pop star should be) feels carefully chosen to highlight Jake and Claire — or, more specifically, Wayans Jr. and West. Wayans Jr. has been searching for a proper means to showcase his talents since “Happy Endings” ended. West hasn’t waited quite as long, but made it very clear between “22 Jump Street” and “The Carmichael Show,” she needed a bigger spotlight. Here, they both get what they need. In Episode 2, while Jake and Claire try to prove they’re still fun, independent people (instead of being defined by their coupledom), they turn around and realize they’re wearing the same outfit. Immediately, they start saying the same thing at the same time. Wayans and West mime each other perfectly, and the sequence goes on so long you have no choice but to kick back and admire their dedication, timing, and execution. The same could be said for the show overall. “Happy Together” may sound like a generic title for a sitcom about the ups and downs of marriage, but it’s better viewed as a cipher. Everyone is happy as long as these two are together. The stars get a vehicle worthy of their range and abilities. The producers are excited to create more absurd fun for their comic duo, and the audience should be happy in the long run, admiring a knowing farce at a time where the world’s dark buffoonery needs to be ignored. “Happy Together” may not become an iconic sitcom, but it’s already a pretty good source for happiness. 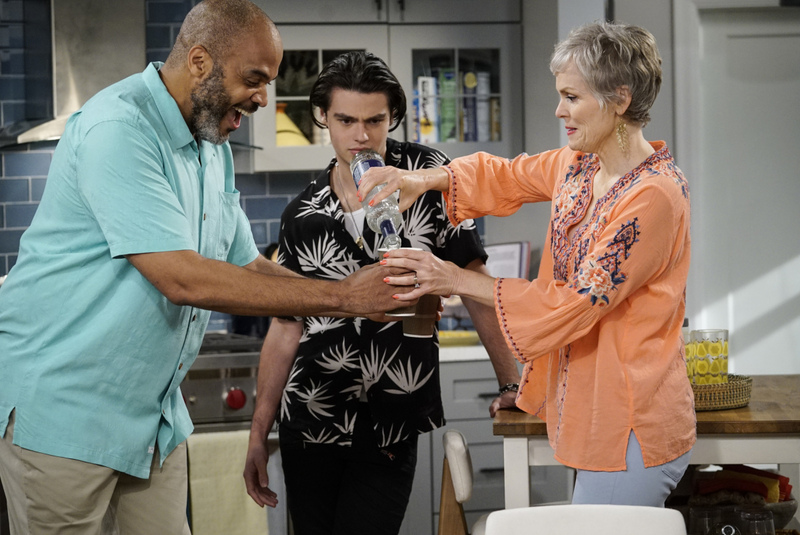 “Happy Together” premieres Monday, October 1 at 8:30 p.m. ET.